It can be hard getting back into the swing of classes, exams and studying after the holidays. To make the transition easier, here are six tips for starting the Spring 2019 semester off on the right foot. 1. Register for classes early. Trust us, you will want to register for classes early! 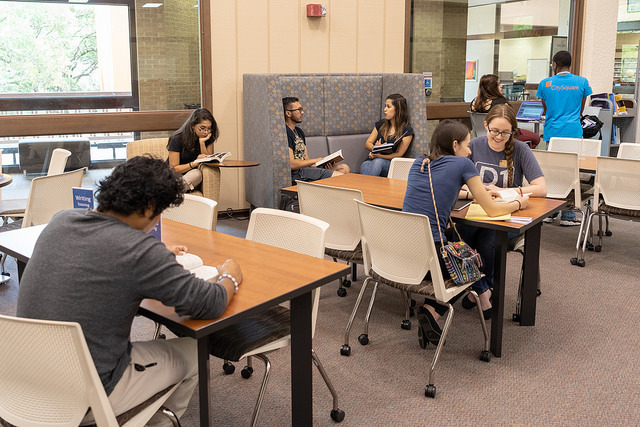 Classes will fill-up quickly and there is no late registration at Dallas Community Colleges. Registration for Spring 2019 will open for returning students on Tuesday, Nov. 20 and for all students on Monday, Nov. 26. Still unsure what classes to take? Head over to the Spring 2019 class schedule to check it out. While you are there, take a look at the Wintermester class schedule. Don’t forget that Winter Term is included in the Spring class schedule! We realize that things come up and you may not be able to register for Spring classes. Have you considered taking a Flex Term? 2. Meet with an academic advisor. If you haven’t done so already, be sure to meet with an academic advisor. Advisors are here to help you stay on track with your classes and degree plan. Meeting with an academic advisor will ensure the courses you take will count toward your degree. Also, if you plan to transfer to a four-year university, an advisor can check that your classes are transferrable. Interested in seeing if your current classes will transfer? Check out the Texas Common Course Numbering System. 3. Check Out Guided Pathways. Have you heard about Guided Pathways? A guided pathway — it focuses on the specific classes needed to complete a degree or certificate. Whether you’re a new or a current student, a guided pathway is a clear, concise map that takes you through each step of your college journey and helps you transition to a four-year school or enter the job market. 4. Have your class schedule. 5. Buy or rent your textbooks. If you can buy or rent your textbooks before the first day of class, you’re ahead of the game. You will avoid long lines at the bookstore and avoid the headache of the textbook you need being out of stock. You don’t want to be caught without your textbook in class, you will need those textbooks! We get it, college is expensive when you add everything up. Be sure to take into consideration all of the costs of college, not just tuition and fees. If you need financial aid, we have that covered! We have a step-by-step process mapped out for you when applying for financial aid. If you should get turned around and need help, contact us at 972-587-2599 or if calling isn’t your thing, send us an email at facc@dcccd.edu. No two students’ college experiences are the same. Everyone has different goals and dreams, and we are here to help you find your career path. These are just some helpful tips that we hope you take into consideration this spring. Looking for another blog post? Check out other posts right here on the DCCCD blog. Here’s something else helpful. If you find yourself struggling, be sure to visit the Finish the Race! web pages: http://www.richlandcollege/finishtherace. You’ll find a variety of resources assembled to help you overcome obstacles and stay on track! Thanks for sharing your stunning content. It’s very useful for student. Thanks for reading! Let us know if we can help answer any questions. You’re welcome! Glad you are enjoying the blog.